Śavāsana might look like an easy pose, but it actually can take a lot of work to stop and do nothing in your yoga practice. Let’s face it – we don’t live in a culture that encourages slowing down, and the demands of everyday life often turn us into multitasking yogis. Rather than being a reason to keep moving, though, this is all the more reason to take rest. Slowing down and savoring the end of the practice allows for the energy of all you’ve done to really sink into both your body and mind so that you can leave feeling a little more content and at peace than when you walked in. If you ever feel like the practice isn’t working, if you feel agitated after yoga, it’s possible that you need to slow down the finish and spend more time letting all the work you did on your mat settle in. Why do we take rest? Śavāsana is a time to find some balance and really incorporate all the energy and benefits from the effort you’ve expended on the mat. When you’re thoughtful and purposeful in your asana practice, you’re giving yourself the opportunity to replace unhelpful old patterns of thought and being with beneficial new ones. At the end of this time of right effort, the body and mind both benefit from and truly need the time to assimilate these healthier elements and let go of the unnecessary ones. By turning our awareness inward, we can increase the ability to perceive what’s going on within ourselves and develop something called interoception, which is the practice of cultivating insight on the physiological condition of the body. This practice is associated with the autonomic nervous system and autonomic motor control – that is, the part of us that’s in control of normally unconscious and automatic bodily functions like breathing, the heartbeat, and digestive processes. With repetition (which we all know is a cornerstone of yoga practice), we can actually get better at tapping into what is going on inside us and deal more easily with the stresses of life. It’s a rewiring of the nervous system that supports steady engagement in the world. While in śavāsana, we stay awake while remaining relaxed, maintaining a level of mindful awareness and detachment – observing the thoughts, feelings, and sensations of the mind and body without becoming attached and thus exacerbating them. It is a conscious asana where you are fully awake and deeply relaxed at the same time (which isn’t always an easy balance to attain!). At the end of śavāsana, it’s important not to just jump up and go, but rather to take a few breaths to begin gradually and intentionally moving the body and making one’s way off the mat. You get into the posture by lying flat on your back and parting the legs to about the width of the mat. Allow your legs to relax and externally rotate, and lay the arms about eight to ten inches to the side with hands open and palms facing up (as a symbol of receptivity). The shoulders should be dropped down and away from the ears, and the head should rest flat with a slight tilt toward the chest. Arrange yourself symmetrically, lying face up with your eyes closed and breath on automatic. You might notice that some people turn around on their mats to take rest. This is viewed as a sign of respect – generally, it is customary to avoid having your feet pointing to an alter or statues of deities, but follow the house rules on this one if you are practicing in a shala. How long do we rest? 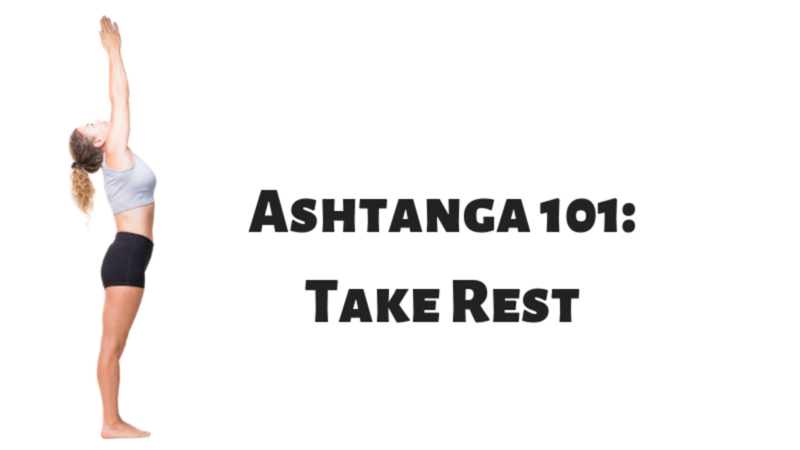 Remain in a still state until your breath and heart rate become relaxed (ideally for ten minutes or more). I’ve been taught by several teachers to take five minutes of śavāsana for every 30 minutes of practice. Frequently, I count down from 100 in my head to ensure that I spend adequate time resting. I’ve never made it to zero – better yet (in my opinion), I gradually dissolve into a state of deep relaxation and everything lets go. On a physical level, śavāsana is a time to consciously turn off the body, stop movement, and allow the rates of respiration, blood pressure, and brain activity to decrease. Muscular and skeletal tension is consciously relaxed and, over a longer śavāsana, it’s possible to release deeper layers of stress and tension from the muscles. Energetically speaking, śavāsana allows for our nervous system to relax. During the asana practice, we work to direct, gather, and contain our prana, or life force, and send it up the sushumna nadi (the main energetic channel that runs the length of our spine). Conscious, steady work with bandhas (energetic locks) and the breath are a means of conducting this effort. When we get to śavāsana, we let go of all that internal energy work and allow it to disperse evenly throughout the body. To me, this felt experience is the truest hallmark of the resting state, bringing a sense of renewal and vitality as we rise again and carry on with our lives. On a spiritual level, śavāsana provides an opportunity to explore the fifth limb of yoga – pratyahara. Pratyahara is a deliberate withdrawal from the senses to gain mastery over the external pull of the material world. It's through repeated attempts at turning inward in this way – however we can do so – that we develop the ability to move toward a place of yoga (samadhi, enlightenment, peace, equanimity). Śavāsana is a practice in surrendering some part of yourself to the greater whole, of giving yourself over to the process and gradually cultivating a degree of faith that allows you to be exactly where you are. Śavāsana is often a stark contrast from the intense concentration that is required to practice a series of ashtanga postures. The resting state that our mind enters for śavāsana allows for the residue of the practice to be assimilated – that is, śavāsana gives us the opportunity to integrate all the hard work of our asana practice into our minds and bodies. I think ultimately, śavāsana is a form of preparation for death – after all, it does get translated to “corpse pose.” It’s the logical end to the practice: sun salutes are the beginning, the birth; the practice is life; śavāsana is death. Śavāsana is an opportunity to let go of some aspect of ourself, to burn through our samsaras, and to prepare for death. In śavāsana, we can begin to resolve some of the detrimental patterns we carry around in this life so as to hopefully avoid carrying them into the next. Just like other aspects of yoga practice, your experience of śavāsana may ebb and flow with the changes in your life. Some days it may be easier or feel more beneficial than others, and that’s okay. Give yourself permission to roll with it and take this time to relax and recharge. This is a time to let go and exhale – after all, just because something’s important doesn’t mean it needs to be stressful. There’s an energy to be gained from unwinding, if you just allow yourself to. Let go. It’s okay. * Thanks to Annette Shellenbarger, Ayurvedic coach, for this tip!